created July 20, 2011, last updated July 21, 2011. This post was last updated 7 years 8 months 29 days ago, some of the information contained here may no longer be actual and any referenced software versions may have been updated! My BuyXGetYFree Magento extension has been updated with the ability to use any Magento coupon code to qualify for a free gift. 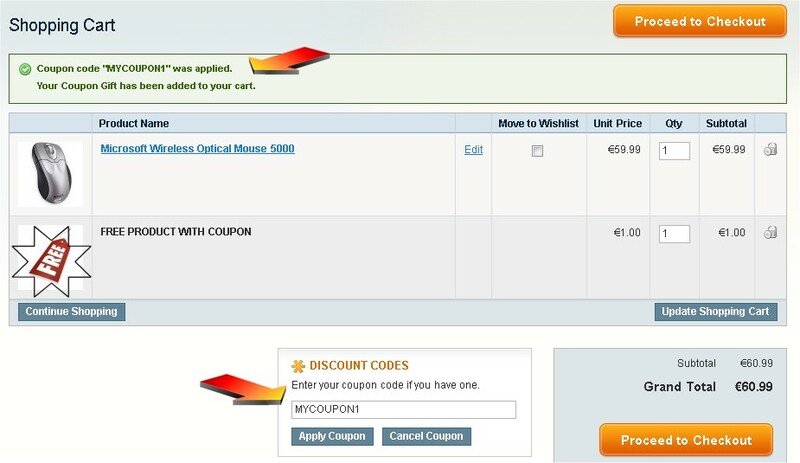 Simply configure a coupon as usual in Magento, set the coupon name i.e. “MYCOUPON1” but do not configure any coupon discount information. Then configure the name of the coupon in the Coupon section of the extension, and the ID of the free product, product Y. You should create a new or duplicate an existing product to create a unique product ID for your free gift. When the customer enters the coupon code, the free product is added to the cart. See the full extension page post for more information and to download. Thanks to Darren for the idea! Hi, have you also configured a Buy or Spend X get Y free product? You cannot share the same product Y across offers, it must be a unique product ID for each buy, spend or coupon offer. e.g. I have a Buy 2 tee shirts get one free offer, and I create a new simple product to represent the free tee shirt with the id of 101. Now I want to also do a get a free tee shirt with a coupon offer. I can’t use the same product id 101 as I used for the buy X offer, I have to create a new on, i.e. product id 102 and configure this as the Y product for the coupon offer. Hi, thanks for the fix. It worked well. I’m testing out the coupon feature as mentioned above. After entering the coupon at the frontend, Its giving me the message saying the coupon has been applied but there is no product is being added to the cart. I’m using version 1.4.2. could this be the issue? Sent you an email. Remember you also have to configure the coupon in Magento Admin under Promotions > Shopping Cart Price Rules. Add a new rule, enable Specific Coupon and enter the name for your coupon and save. This coupon name you should then configure in the extension along with your product Y. Thanks so much. This is a great extension with great support. Keep up the good work. I will need to develop an exclusion list for products you do not want to trigger the Spend X get Y function, will have a look at that for the next update. Added a product exclusion function for Spend X in version 0.61, feel free to test it our for me! Hello, great script. I have an issue with the ‘Buy X get Y free’ offer though, if I have multiple products ‘X’ i.e. around 300 and want to give the same free gift ‘Y’, this should work OK? When I add the list of product ID’s comma separated into the box for ‘X’, the script only adds the free gift ‘Y’ to the first product/ID and not any following products for some reason. Each product X needs to have its own unique simple product Y, you cannot have products 1,2,3,4 etc in the X box and only one Y product id in the Y box, it would need to be 1,2,3,4 in X and 11,12,13,14 in Y. Obviously for 300 X products this is not pratical so you should look at putting the 300 X products into a category and then use the Buy Category X get Y free function. Thanks for the prompt reply, I’ve created a ‘Free Gift Products’ category which is not active/shown and your script now works great! Thanks for your help. PAJ, you’re genius, new version working like a charm! Thank you again, keep going! I must be doing something wrong, could you please assist at your free time? Thank you so much. I apologize the last post for being lack on details, I’m trying to set up a “Coupon X Get Y Free.” I’ve done everything as stated in instructions but I’m unsure which steps I may have messed up to cause that error message to pop up when I apply the coupon to my cart. Hi, perhaps you can email me a screenshot of your coupon x configuration screen and I will have a look. email to extensions at gaiterjones dot com. I want to give 5 products as free gift products with one single coupon code. is it possible with your extension?? Do you want to give five different products as free items? I would suggest creating a simple product to represent the free items and use this as the product Y, otherwise you can only provide 1 product y per product X with this module. whenever i go to cart after adding items it shows like even though the condition is met and also i tried adding more items but it results in following error message only. free gift is out of stock and cannot be added to the cart! If the extension says it cannot add the product because it is out of stock then the free product you have configured must be unsaleable, this is either due to it having no inventory, or because it is disabled or otherwise not saleable. Check the config of your Y product. I have cross checked all those things like inventory, status of the product and it’s saleable product. BUY 2 GET 1 FREE is out of stock and cannot be added to the cart! I left with no idea about this, Could you please help me out. I installed your module and it’s working great. I’m working with use coupon get free gift. But when I use a onestepchekoutpage and i want to add a coupon code the gift isn’t added to the store cart ? But if i go the the cart, the cart gets updated and then the free gift is added. Can you point me in some direction on how to update the cart? Or how to refresh the cart contents manually. maybe in code so that the customers can’t see whats going on in the background. Thanks for developing this extension. It works fine for one product ‘Y’. But what we want is to have multiple free gifts. Would you please help me us with that? If you have mutiple gifts then you must comma seperate all the configuration values, productx1, productx2, productx3, producty1,producty2,producty3, qty1,qty2,qty3. etc. etc. Hope that helps. I am having trouble getting multiple coupon codes to work. It works if I enter them one at a time. But when I enter them as coupon1,coupon2 the first one works but not the second one. Which ever one I have first works, but not the second. Your extensions has really helped me out, but I realized today that the free gift items that I’ve set up with the Coupon Code X Get Y Free have independent SKU’s that can be added to the cart by a customer regardless of whether or not they have input the code. This might not be a problem if I were able to simply hide the products in an invisible category, but my checkout cart specifically lists the SKU of each item that gets added, so the promo item SKU shows up. Is there anything you can suggest that I can do to prevent the independent SKU of the discounted product from being a problem for my store? Thanks very much for any suggestions you can offer. The y product should not be visible in the shop and I would recommend modifying the cart template so that the sku is not shown for the y product, or any product with a 0 price. Hi, I can’t seem to make this extension work on my shop, it may be due to the amasty special promotion extension I installed – do you think having a custom set of promotions may create problems? Do you have any suggestions on how to fix that? i use CE 1.9.2.4 and have installed and configured exactly as mentioned. I get no errors and the coupon is applied successfully but the free product is not added to the cart / checkout review section.